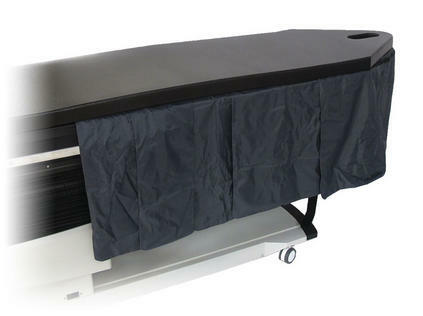 Free-float tabletop design with quick and comfortable patient positioning at an affordable price. The Surgical C-Arm Table – 846 is designed for procedures where stability, access and precise, quiet, vibration-free positioning are essential. A cantilevered low attenuation carbon fiber tabletop, with choice of contoured or rectangular design, accommodates portable or ceiling-suspended C-Arms. The standard contoured top allows ample workspace for anesthesiologists, yet the narrowness required for cervical procedures. The rectangular top offers additional space to allow for superior image quality for long-leg runoff studies. Choose a tabletop to best fit your needs to achieve optimum image resolution. 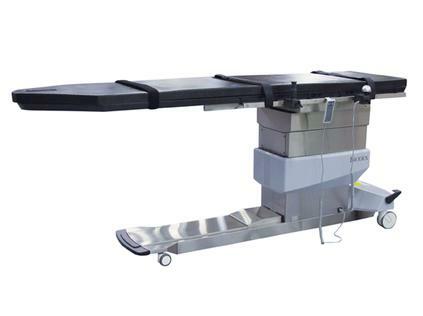 Its large radiolucent area, motorized actuation of height, and free-float tabletop make it ideal for pain care, cardiovascular and interventional radiology applications. The radiolucent area is free of cross members, allowing full fluoroscopic visualization and unobstructed C-Arm positioning. Functional design provides complete access with reduced radiation exposure to clinicians. Two-inch thick table padding and three adjustable straps with hook and loop fastening assure patient comfort and stability. The contoured tabletop features a face cutout for comfortable prone positioning. The portable, hand-held controller offers the freedom to adjust height from any point around the table. An ergonomic, mushroom-shaped control optimizes command of the SmoothGlide™ free-float tabletop. Tabletop Motion – Expansive head-to-toe, 35"
Radiolucent Area – Extra-large, 75"
end of a hand grip. This design fully accommodates C-Arm positioning for closest possible access to the cervical spine, achieving optimum image resolution. A second benefit is the added workspace at the head end, while maintaining the narrowness required for cervical procedures. Features a cutout for comfortable, prone positioning. The rectangular tabletop offers additional space to allow for superior image quality for long-leg runoff studies. 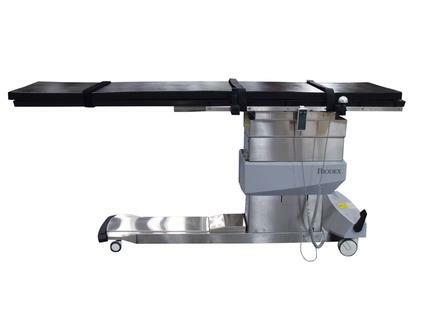 Biodex Surgical C-Arm Table 846 is designed for image-guided fluoroscopic procedures. Ideal for cardiovascular procedures with three-axis motorized positioning and XY free-float top. Medical equipment manufacturer, Biodex, demonstrated enhancements to their line of C-Arm Tables at the Radiological Society of North America’s Annual Meeting last month. Beneath the new stainless steel aesthetic are details to improve the entire imaging process for radiologists and their patients.